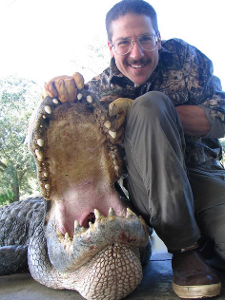 At HHGatorHunts.com, our alligator hunting packages in Orlando, FL, include: pick up and return to the Melbourne airport, lodging, and all licenses and state fees. The alligator is yours: the head, hide, meat, and all of the attitude that goes with it! We will make your reservations for two nights at a local hotel, and we supply the boats, all the equipment you need, and an experienced gator hunting guide. There are no additional fees for the time and expense of delivering and retrieving your gator to/from the processor. We will also provide your items to the local shippers or our local taxidermist or tannery. You can take advantage of our group discounts on guided wild alligator hunts, as well: the larger the group, the greater the discount! The only additional expenses are for the processor—$25.00 per foot. If you would like the meat, at no additional cost, we will transport the alligators to the processor and retrieve them later. We will also pack and ship to either the local taxidermy or tannery. Our team can also send the items to any other location you choose C.O.D. We can either trade you out some meat we have on hand so that you can return home with frozen meat, or we can ship you your meat C.O.D. later. We offer hunting trips year-round on private property. This allows you to enjoy your adventure on your schedule. For those looking to explore something a little wilder, we hunt on public property from August 15th - October 31st. Head east on hwy 528 also known as the "Beachline". Travel approximately 35 miles over to the town of Cocoa and hwy I-95. Head south for approximately 25 miles to exit 180. You will take exit 180, turn left, go 200 hundred yards to the second traffic light, turn left go 100 hundred yards to the Hampton Inn. P.S. There are only so many "trophy gators," so call us today to reserve yours! 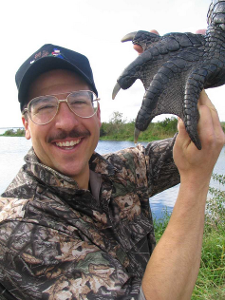 These Florida alligator hunts are done year-round day or at night. These Florida alligator hunts are done year-round, during the day or at night. Different hunt types require different conditions, but our private property allows you to customize your experience. No matter your preference, you’ll enjoy fantastic thrills as you track down—and take down—gargantuan predators with prehistoric ferocity. Private land hunts may be done during the day with riffles as a spot and stalk hunting. Sport-sized and trophy-sized kills may be taken during these hunting trips. Alligators of either size may also be taken at night from an airboat with a bow, crossbow, or a hand-thrown harpoon. Once you have you kill in-hand, we offer everything you need to make the most of the experience. Whether you want to keep the meat or take some teeth for a trophy, you’ll go home with more than just great memories. That’s what makes us the trusted name in gator hunting, in one of the most bountiful places on the planet to take up the sport. 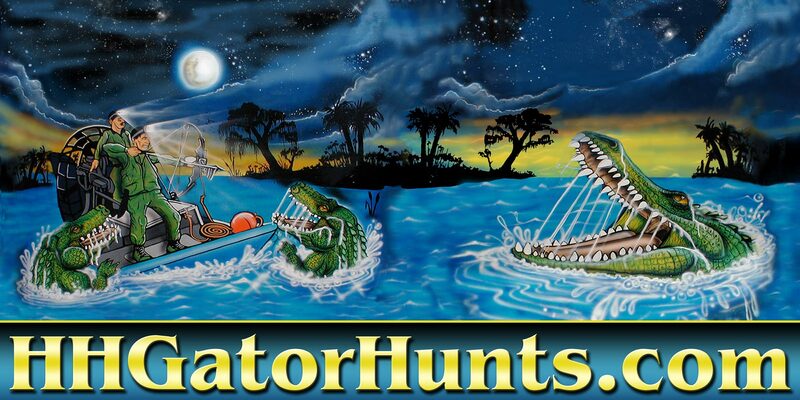 Sport hunting for alligators is done year round we average 7-7.5 feet on these hunts. These are one or two day hunts. We use rifles for day hunts, and bows, crossbows, or harpoons for night hunts. Rifle hunts use a spot and stock based methodology. The fee for a sport hunt is $1,850. Want your shot at the record books? We can help you take it. The Florida trophy gators you have the opportunity to find with us will be a minimum of 9ft long. These behemoths offer greater challenge, awe-inspiring photo opportunities, and an unchallenged option for competitive hunters. Whether you’re a life-long sportsman or a fearless first-timer, our guided hunting trips give you the best chance to find brag-worthy gators. We average 10-10.5 feet on these trophy gator hunts. These hunts are done the same as the sports hunts but may require an extra day. The fee for a Trophy hunt is $4,500. Additional sport-size gators may be taken on any private land hunt, but only by the same hunter and method during the same hunting trip for $650 each. Regardless of the package and methods you choose, we’ll make sure you can make the most of the outing while building your skill, reputation, and trophy collection. We guarantee that our gator hunting guides will provide you with every possible opportunity to harvest the largest alligators in the area. 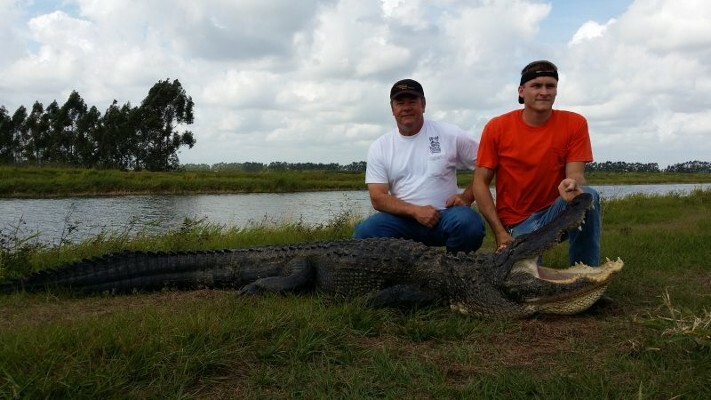 These alligator hunts are only done from Aug. 15th through Oct. 31st and may only be done at night with bows, crossbows, or harpoons from airboats. 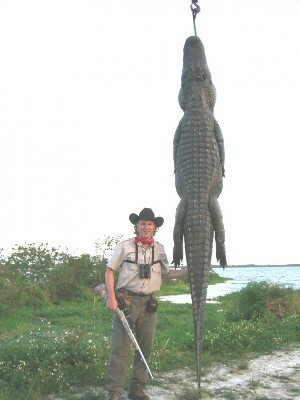 Either size alligators may be taken during these hunts (sport or trophy gators). This is by far the most exciting and challenging method of harvesting alligators. These are all night hunts: for one night for sport-size gators or two nights for Florida trophy gators. An additional night may be needed if we have bad weather. It has never taken three nights to complete a trophy hunt yet. These Florida alligator hunts are done on thousands of acres of open lakes, canals, and swamps. On these hunts, you will see Florida's wildlife as it has been for thousands of years. You will see well over 100 gators in a night. When the sun goes down, the swamp comes alive with eyes and sounds of the wild. You will enjoy the airboat ride of a lifetime, going to some of the most incredible locations around. 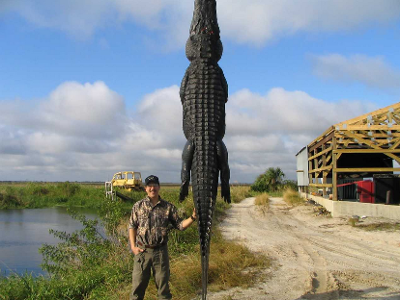 While sport hunting for alligators, our customers have taken several shots at different gators over twelve feet long. We want your adventure to be as accessible as possible. To that end, we strive to minimize our prices and focus on what we do best–providing an unforgettable experience for every customer. One hunter, one sport size gator $1,850. One hunter, two-sport size gators $2,500. 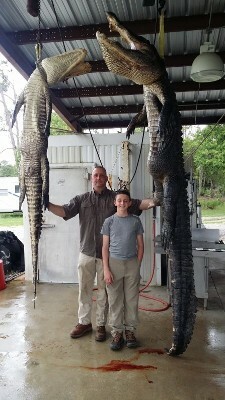 Two hunters a sport size gator each $3,200. We guarantee that our guides will provide you with every possible opportunity to harvest the largest alligators in the area. When you choose us, there’s one thing you can always count on: a complete hunting package that comes with the promise of exceptional adventure for every participant. We guarantee that our guides will provide you with every possible opportunity to harvest the largest alligators in the area. If you have your own gator hunting tags, please call for prices. The only additional expenses are for the processing of your alligator. These fees are for processing your hide and meat—$25.00 per foot. If you would like the meat, I will ship it to you or trade out an equal amount with what I have on hand. Contact us to book your gator hunting trip today. We proudly serve Orlando, FL, and the surrounding areas. We appreciate your interest in our alligator hunting packages, to book a hunt by clicking here on our Contact page or revisit us for updated information.